Please click through to see the full affordable housing map of the New York City metropolitan area. The images above were generated using their pdf generator, but the full flash version is simply better. Maps are hot. They’re everywhere. I was at a final presentation last night and one of the students said, “I’m kind of a map geek”. I didn’t realize it was possible to be a map geek, but I’m starting to understand. It’s quite easy to present a map – maps have been in use for centuries and some of the oldies are still goodies. It’s not so easy to combine a map with social science data in a smart, legible way. Folks try all the time. These folks at the Center for Urban Pedagogy got it right. Their affordable housing map tool is a solid example of the capability and execution of interactive data. The map itself has been stylized. All they want to show you is neighborhood boundaries and neighborhood names. Gone are street markings, terrain, unnecessary color, landmarks, subway stops, and so on. They’re going to add some layers and your eyes are going to be better off without excess detail at the level of the map. Plus, they’re helping you to understand that it isn’t possible to get more granular than neighborhood masses. You can’t use this map to look at property values by block or by proximity to a subway stop so there’s no reason to include the subway map or street markings. This grey massing approach helps focus my attention (and hopefully yours) on the layer of information about income by neighborhood. This information IS in color. It is added as a layer on top of the map without obscuring the map. They’ve used a modified bar graph layout in which information is embedded in the x-axis itself. The y-axis is implied – that’s just fine here. And it’s interactive. In a good way. From a technical perspective, this site makes good use of Flash. It loads quickly and is responsive. Once a neighborhood is selected the bar graphs realign themselves with colored blocks flying in from cyberspace to construct the balance of income for that neighborhood. Note that this is enough movement to make the whole experience a little exciting, a little sparkly but it doesn’t take so long to load or run that you’ve lost interest before you’ve gotten through it. It is my pedagogical opinion that the best graphics encourage the viewer to formulate a question which is then answered. In this case, what we see first is a neighborhood map. The viewer has to pick a neighborhood before any of the juicy data is revealed. This is great. 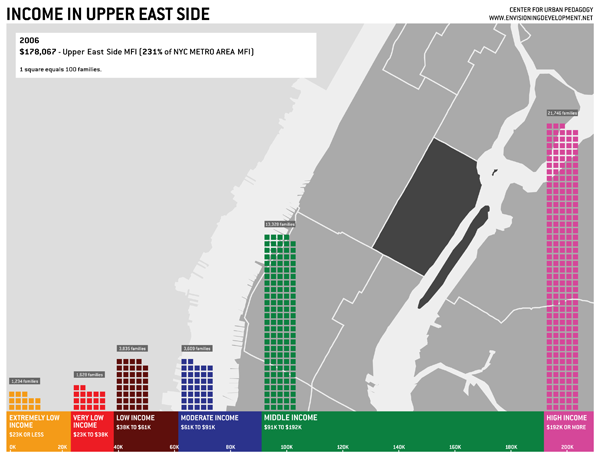 Now, say, we’ve picked the Upper East Side and we see a towering skyscraper-like bar graph way over in the “High Income” department. 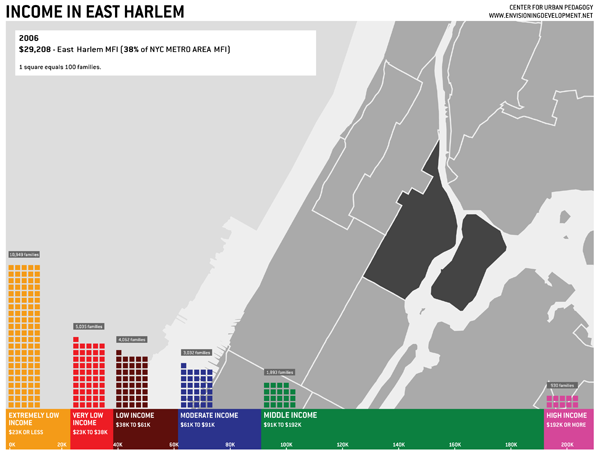 Our next step can either be to compare to nearby neighborhoods, by clicking on East Harlem to the north, or to add the information about housing prices. The title is “What is affordable housing?” so clearly this is what the designers hope you’ll do. But they aren’t so impatient about it that they try to incorporate it into the first splash page. Center for Urban Pedagogy. (fall 2009) Envisioning Development project. New York.